Sharon Osbourne loves real estate. She told Architectural Digest that she frequently gets “itchy feet” to move: “We’ve never stayed in any place longer than seven years.” After Kelly and Jack left the nest, they sold their “Contemporary Goth” house in Beverly Hills (made famous by their reality show on MTV) and bought a place in L.A.’s exclusive gated Hidden Hills community. Last year it was reported that the Osbournes owed over a million dollars in unpaid taxes and might lose this house or the one they own in Malibu if the IRS chose to seize them. They were able to settle their debt in time, but they put both houses on the market. The asking price for this one: $12.999 million. The living room has trendy sliding barn doors and a reclaimed-brick fireplace. 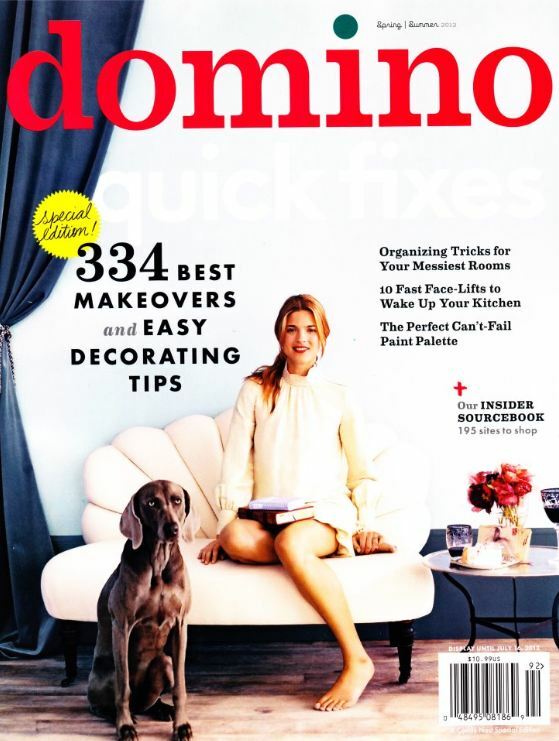 I loved watching Martyn Lawrence-Bullard work his magic on houses on the reality show Million Dollar Decorators last year (and I was excited to hear that Bravo renewed it for a second season). There don’t seem to be many area rugs in the house. Wonder why? Martyn Lawrence-Bullard also decorated Grey’s Anatomy star Ellen Pompeo’s house in the Hollywood Hills. Want it? Check the listing by Jonah Wilson for more photos and information. The magazine photos were taken by Roger Davies. Earlier this year, the Osbournes also had their vacation spot in Malibu on the market for $8.795 million, but it sold last week. …and some pretty fabulous ocean views. While we’re dishing about Osbourne family real estate…remember the house they lived in when they were filming their reality show for MTV? They sold it to Christina Aguilera in 2007 but it’s on the market again. Check out photos of how it looked then and then compare it to pics of how it looks now that Christina Aguilera owns it. Beautiful C. Cod house but the interiors look like they are of the “3 Faces of Eve” brand and all 3 personalities are waging war over who has control. The campy American, The upscale French and the JPU. The French won the battle but the JPU (Just Plain Ugly) won the war. The Campy gets an honorable mention. Mr. Bullard’s designs are not real impressive in this house.There’s a lot going on in this here…. and little of it is good. You got your creepy, crib-like baby blue chairs in the foyer, weird miniture spotlights and equally creepy Italian dolls scattered about the living room, a hi-tone French pink sitting room, an antiseptic looking French-style bedroom, a study/library that looks dark, cluttered and nothing matches, a “Snow White type looking glass mirror” that only Millificent could love (I truly think that’s the ugliest mirror I’ve ever seen in a dining room). The kitchen starts out looking upper French country and turns into camp with the “lunch room” sign, various mix-match lighting fixtures and a mini cash register. Not to mention the non-descriptive roosters…but I had to mention them…I was pulling for anything inside to like by the time that photo rolled around. I understand changing up the flooring but you need to set it up to flow easily from one room to the next. It looks like they walked around Home Depot and asked people what flooring to put in, agreed with everyone’s suggestions and used them all. And you got 12 dogs and a white couch which apparently they are all allowed take advantage of it. I shudder to think of the cleaning bills for this place. No wonder they couldn’t pay taxes. I think the dining area/sun room off the kitcken is probably the best thing there. The whole thing is scary….and ugly. The kitchen and view are great, but the master bedroom looks so cold with all that tile floor everywhere! I love the house pictured first. The interior is a bit too Goth for my taste, I would redo in beachy vibe, and no spooky dolls. No area rugs? No problem! I think if you are drunky there’s less of a slip and fall hazard, lol. wow..I wouldnt even know how to ACT in either of those homes. They are amazing, but..I guess thats how the other half lives! Hope you had a great Easter, Julia! I think the house is just gorgeous! Most recent house is my fav, I think. The kitchen in that house with the vintage finds on display is really cute and lovely. I just wish that style ran through the rest of the house! Cape Cod inspired? Well , maybe the first floor and exterior…the bedrooms not so much. Thanks for including the AD pictures — it’s fun to see what a difference professional photos make. The outside of the house is stunning. The inside….there just wasn’t any flow to the style, it seemed like I was looking at individual photos taken from several different homes, not from one home. The inside definitely does not match the outside, which is too bad as the cap cod style can be so homey and relaxing. Love those barn doors and some very interesting light fixtures. I am so excited about Million Dollar Decorators 2. The Osbourne’s cape cod house has been for sale for a while, but no one seems to want to buy it. I love the cape cod house, but find it sad that there’s not much of the cape cod style intact. I hope someone can buy this house and bring back the original style. The beach house is nice, but it doesn’t have that relaxing feel or style to it. As for the MTV house, it’s been for sale for a while, but no one wants to buy it because it’s hideous. It’s hard to buy a house if you can’t picture yourself living there or if there’s too much updating to do. The views are nice and I love the patio and the eating area, however it’s not my style. The Malibu home is nice too, especially the views, but I don’t care for an all stainless kitchen. The third home, which they sold to Christina Aguilera–I only like the outside which is gorgeous, but the interiors are not too keen on. So many of the homes seem really big on shine, which I’m just not a fan of. I like a balance of finishes and texture. Personally, I love the curb appeal! I don’t think there are any rugs in any room because Ozzy would be tripping on them with his little shuffle and be face down everytime he entered a room! I love the house they are in now! That dining room is one of my all-time favorites… I have blogged about it! I wonder where they are moving now? I know it will be stunning. I love Sharon’s taste! I WAS A HUGE FAN OF THE OSBOURNES, NEVER MISSED AN EPISODE!! I LOVE SHARON OSBOURNES STYLE!! THANK YOU FOR SHOWING ANOTHER GREAT EXAMPLE OF IT!! Quite extravagant for my taste but I do love all the soft colors. Haha! These people have obviously never been to Cape Cod. I think I would love that living room if you took all of the designs (?) off of the barn doors and got rid of the chandelier and most of the furniture. If you stripped this house of all the chandeliers and ornate everything I think I’d love it. Their style doesn’t seem to be suited at all to Cape Cod. 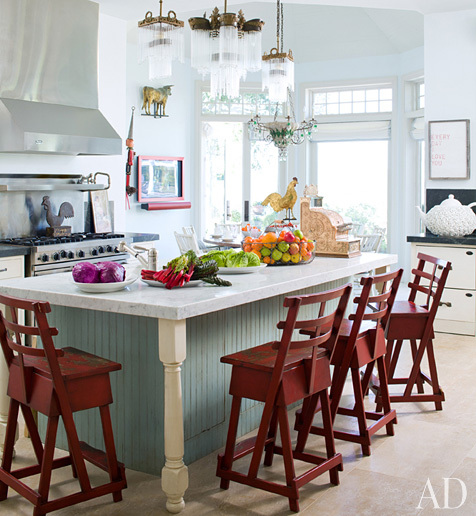 I absolutely love the Osborne’s kitchen…a little surprising to learn she antique americana! Thanks for sharing! Hmmm…they certainly have a unique style but the tiled bedroom seems cold to me. On the other hand, love certain elements: the matted black and white photos, the antique cash register,etc. an eclectic style with most of the home too over the top for me…but they seem over the top so I guesses it suits them. A bit too ornate and dramatic for my taste. Her kitchen is cute though. He’s quite a business man!I’d do the same thing if I were him but firstly I need to have money in order to buy such houses! That was one great house!Too bad! All I can see are dogs who ruined the home portrayed in a reality show back a few years. I think over time they would be replacing flooring/furniture due to how the dogs were able to run wild. I’m also not a big fan of animals on kitchen counters where you prepare food which was common practice for the Osboure. I know this house and have been in it many times with the original owners…. when it was authentic and beautiful. The Osbornes mucked it up like they do every one of their homes. No accounting for taste. Would have loved to have seen what it looked like originally!